I had the pleasure of helping out as a teen leader at the best cafés I had ever been to. The café was called “Brain Hackers” with Dr. Chris Forsyth, and was essentially an amazingly entertaining presentation about neuroscience and the 12 things we needed to know about our brain. 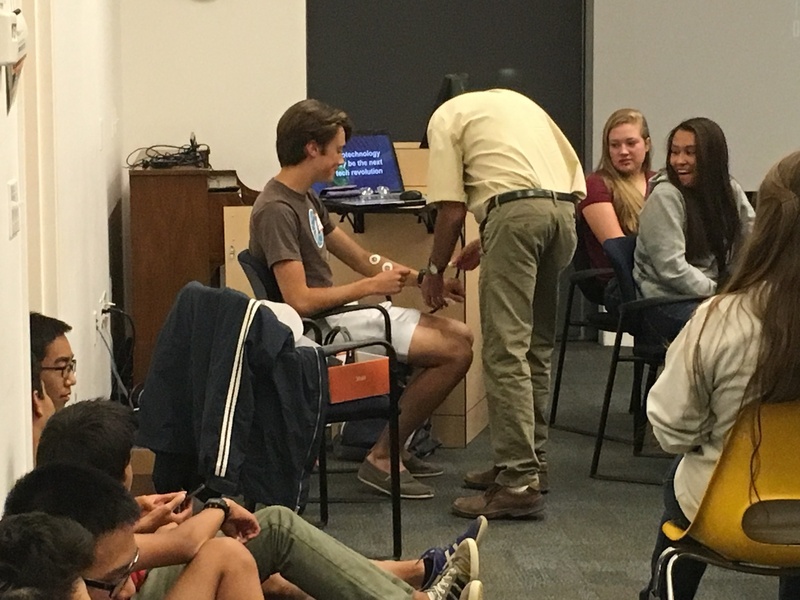 During his presentation, Dr Forsyth hooked up one of teens to an electroencephalogram (EEG) that showed changes in the electrical waves of the brain. On the screen, we were able to see how his brain reacted when the teen was asked to do something physical, and how it was different when he was asked to think about something. Dr. Forsyth also made us aware of the how different situations can change our decision making skills when asked the same question. He showed two teens a picture of two apartments and asked them to choose one to live in. One teen was able to think about their decision, but the other was rushed to pick. The teen who was rushed picked the apartment they didn’t want, but just made a haste choice. I was actually the one who got in contact with the speaker by giving him our café card and explaining what we do. This café was extraordinary for many reasons. The first being the sheer amount of people that showed up. We had nearly 100 teens in the room interested in the speaker and the free food. On top of that the crowd was amazingly diverse. I had many of my friends attend. Great attendance for our first café of the 2016-17 season. Afterwards I text them and they can’t wait for the next one. Also another great thing was how well people covered it on snapchat. When I got home I went to check snapchat, like I usually do, and about 8 different stories people had posted stuff from the cafe! One thing I did not expect was to run out of food and run out of seats for people! I went to go look for the IT guy around 6:10 and when I came back 15 minutes later we had a line out the door! We had to get chairs from other rooms and the hallways to accommodate the large crowd. The most important thing I feel is how the majority of the crowd loved the content. There were only a few cons, we ran out of food, the presentation was long and that’s about it. Overall our Brain Hackers café was a great success!